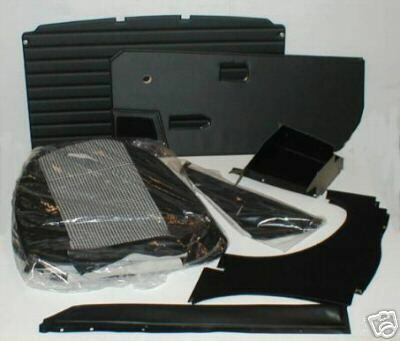 A FULL INTERIOR TRIM KIT AVAILABLE IN ANY STANDARD ORIGINAL COLOUR FOR ANY YEAR / MODEL OF TRIUMPH SPITFIRE. THE KIT INCLUDES ALL TRIM PANELS/ SEAT RECOVER KIT / DOOR CARDS /REAR COCKPIT PANEL/ DOOR CAPPINGS / CARPET SET / GLOVE BOXES / ARM REST OR HANDBRAKE CONSOLE RECOVER & TRIM PANELS - FIXING SCREW SETS. THE EARLIER MODEL KITS AND SPECIFIC COLOURS OTHER THAN BLACK ARE MANUFACTURED TO ORDER SO PLEASE ALLOW 2 - 3 WEEKS FOR DELIVERY .